Warsaw - Mario Balotelli will have both his family names on his Italy shirt at the European Championship. UEFA's official tournament list shows that the 21-year-old forward has registered "Barwuah Balotelli" as his shirt name. Balotelli was born in Sicily as Mario Barwuah to parents of Ghanaian descent. His African heritage is now being stressed days after Balotelli said in an interview that he will walk off the field if he is racially abused at Euro 2012. 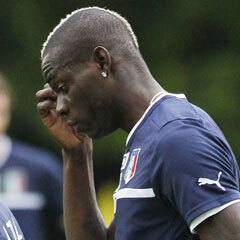 He took the name Balotelli from his foster parents in Brescia, who brought him up after he became ill as a toddler. He uses just the Balotelli name on his shirt when playing for Manchester City. Italy open their Euro 2012 program against Spain on Sunday in Gdansk. UEFA's list also shows how Denmark have solved the issue of identifying three players called Poulsen in their 23-man squad. Midfielder Christian Poulsen will wear "Chr. Poulsen," midfielder Jakob Poulsen will have "J. Poulsen," and defender Simon Busk Poulsen will wear "Busk Poulsen." Eighteen-year-old England winger Alex Oxlade-Chamberlain will have only "Chamberlain" on his shirt.